All in all, this is a strange book. 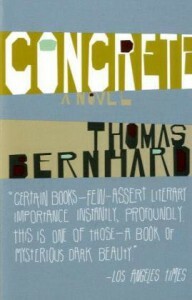 I really enjoy books that toy with form, and Bernhard definitely does that in Concrete. For one, the entire novel is one paragraph. Yes, one. 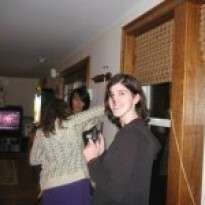 There are no "passages" or line breaks--it's all one long inner monologue. Some may find this book tedious, and not just because of the block paragraph format; for one, the narrator is a bit loopy. The narrator is an agorophobic middle-aged man. He's a few political opinions away from being a conspiracy theorist, and he generalizes everything: art, religion, travel, literature, wealth. Nothing impresses him, not even the composer he is obsessed with. The narrator originally intended to write a biography on a little-known composer, and instead came up with this stream-of-consciousness narrative. Yet despite his flaws, he is a live character, flawed and lonely. Because after these oversimplifications, in which he insults his country and his family, he goes back on his own opinions and temporizes his story. He is constantly adjusting his perspective on life, making ridiculous claims about the world that are so bitter that they're funny. Reading the story, I highlighted and laughed aloud at the absurd claims he makes about owning pets and living in Vienna. He takes everything he experiences, and everything he believes so seriously, that as a reader I couldn't. But that was half of the fun. In the final ten pages, the novel takes a strange perspective turn that doesn't add up with the rest of the book. Maybe this was meant to show his emotional deterioration, but it was an abrupt departure from what I had been reading. Otherwise, if you read this book slowly, and keep the humor in mind, this is an enjoyable read.